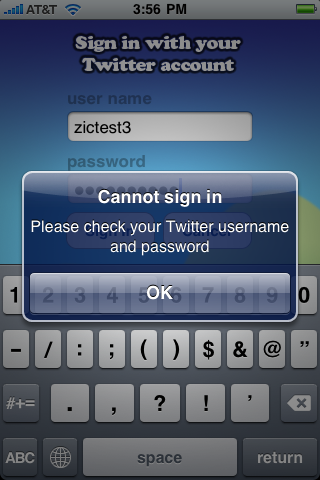 Apple has a lot of silly reasons for rejecting iPhone apps, but Twitter seems to bring out some of the best of them. A few months ago, Apple rejected the popular iPhone app Tweetie because it featured curse words in the trending topics area — something which obviously the app has no control over. Today, it appears another app has been rejected because of Twitter — only this time it looks like it was rejected because the reviewer who looked over it did so on Friday when Twitter had its scheduled maintenance. Young also sent the picture Apple attached, and notes that the timestamp seems to prove that Apple was testing it when Twitter was still Fail Whaling big time after its planned maintenance on Friday. While on one hand, it’s kind of hard to blame Apple for a Twitter downtime that it’s almost for sure not paying attention to — on the other, it’s kind of lame that these app checkers only apparently check it one time during a day, and if the service it’s tied to is down, they reject it. Yong notes that the app works fine now, so no changes are needed but he’ll still have to resubmit the exact same app and wait another several days before its reviewed again. The moral of the story I suppose is to coordinate your app approvals with Twitter (or any other service) downtime. Twitter actually was supposed to have more maintance today, but postponed it. We hear they did so because of the NASA mission that was planning to tweet today. And while they didn’t give a reschedule date, we hear it may be Wednesday. So iPhone app developers working on Twitter apps, do not let Apple review your app this Wednesday. Unless you like headaches.